Making Room for God offers an enticing and entertaining approach to decluttering, discipleship, and the spiritual life that makes tidying up seem almost fun. Writing from an unabashedly Catholic perspective and with convincing practicality, Sperry looks at the role of material goods in the life of a follower of Jesus. Each chapter includes humorous and often self-deprecating details of the author's own journey through decluttering to help us believe that we, too, can simplify. Alongside these adventures are Sperry's rich spiritual insights gleaned from extensive knowledge of the Church's tradition and helpful exercises for freeing ourselves from clutter and the temptation to sin it so often harbours. Sperry draws liberally from the Bible, liturgy, Fathers of the Church, lives of the saints, and Church teaching-especially that of Pope Francis-as she explores the relationship between our stuff and our spiritual lives. Practical elements offer a step-by-step approach to decluttering living spaces, getting rid of unused and excess items, and limiting future accumulation. 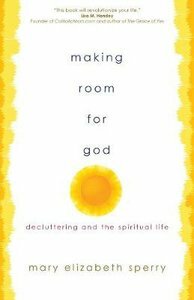 About "Making Room For God: Decluttering and the Spiritual Life"